A variety of ships at the sanbashi pier in Osaka Harbor, Osaka. Osaka Port was opened to international trade in 1868 (Keiou 4). It soon became way too small for modern ships, and on October 17, 1897 (Meiji 30), construction started on a modern port designed by Dutch engineer Johannes de Rijke (1836-1900). 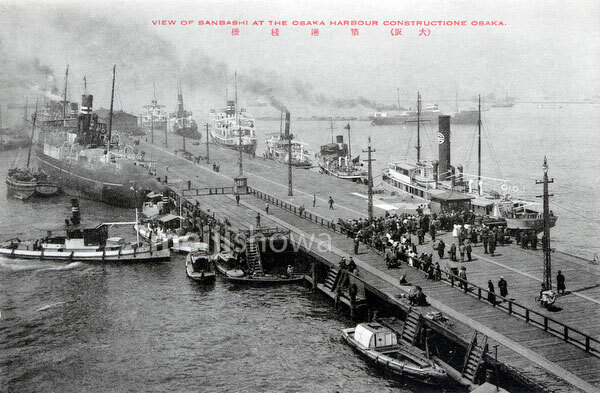 In 1903 (Meiji 36), the pier in this photo was completed. Also see #70420-0022.